Driveway Coatings From PolyTek. Professionally installed driveways. At PolyTek Surface Coatings, we understand that you need top-quality protective floor coatings at the right price. Let our years of experience help you find the perfect surface coating for your application. Whether you need concrete garage floors, commercial facility floor coatings, or floor coatings for manufacturing plants, we have a solution that will provide long-lasting protection and visual appeal. We use the best in coatings technology to create low-maintenance, anti-skid surfaces. We also perform floor coating repairs to keep your floors in top condition. 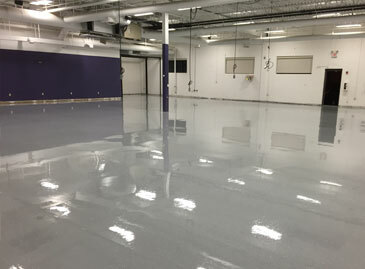 We proudly provide both residents and businesses with quality solutions including epoxy or polyurea floor coatings, and our floor coatings are typically installed in one day. We are a full-service concrete floor coatings and restoration company for Minneapolis, St. Paul, and the entire Twin Cities metro area. With superior technology and advanced chemistry, we proudly use Penntek Industrial Coatings systems for all your flooring needs. We combine the best materials with fully licensed and insured installers to ensure that your concrete flooring project is completed quickly, efficiently, and professionally. Whether your concrete floor is needed in a residential, commercial, or industrial setting, we have the expertise to provide you with the right concrete floor solution. Our services for residential projects include coatings for garage floors, basement floors, pool decks, patios, sidewalks, and more. In addition to new surface coating applications, we also offer repair and restoration of existing floors. We offer a 15-year warranty on all residential surface coating systems for your peace of mind. 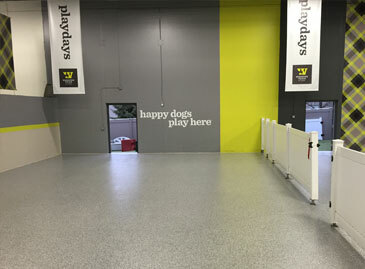 Our commercial surface coatings are ideal for commercial kitchens, pet boarding facilities, locker rooms, retail spaces, showrooms, and salons, as well as industrial and manufacturing facilities. Quality surface coatings keep employees safe, have high aesthetic value, and are easier to clean and maintain. We offer a five-year warranty on all commercial surface applications so you can be confident in your new floors. 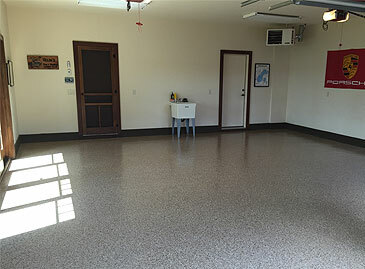 Concrete polishing is a must-have flooring solution, and we offer high quality concrete polishing services in the Twin Cities area. Polished concrete floors are easy to maintain, long-lasting, and can extend the life of your existing floor. Polished concrete is also safe and environmentally friendly. Whether you’re a homeowner or managing a commercial facility, we work with you to determine the best possible surface coating system for your needs. Either online or by phone, you can contact us to discuss your project and set up a time for your free consultation and estimate. From material selection to color choices, our experienced team members will analyze your home or business to make sure you have the right flooring solution. We carefully prep your floor before installation with state-of-the-art technology, and apply your coating and sealant safely. You can generally walk on the floor in four to six hours, and drive on it after 24 hours. At PolyTek Surface Coatings, we are committed to complete customer satisfaction. With experienced installers, fast and efficient installation and service, and an understanding of the best technologies and materials in the industry, we are always working to meet and exceed our customers’ expectations and give them the best possible floor coating solution. No matter the project size, our team will work to execute it perfectly. We make it easy to get a complimentary consultation and in-home price estimate, so contact us today! We are proud to be your trusted surface coating and restoration company in the Twin Cities metro area.